This post will focus primarily on the white swan as when I get onto my Australian animal cards, there is a black swan. “I have looked up on those brilliant creatures. And now my heart is sore…. Trod with a lighter tred. If you’ve never had much do with swans, you’d probably agree with Yates’ description of them as mysterious and beautiful. As someone who lives in a city of ducks, geese and swans, I’m telling you they are vicious. They are highly aggressive, especially when parenting. There is a claim that they can break a mans arm and I fully believe it. These are strong birds. They are big and they are violent. Do not let their graceful, angelic appearance fool you. Swans mate for life (unless one of the pair dies or occasionally divorce occurs) and this follows on from an elaborate courtship. The two potential mates dance and check each other out. As they do so their long sleek necks come together to form a heart shape. Because of this, their fidelity and their whiteness they are often used as a symbol of pure love. They are a sign of commitment and constancy. The tranquil swan appears to float through life without any troubles which can invoke jealousy in others. When it comes to mythology and folklore it’s hard to know where to start! Beginning in England, we see the swan as a royal bird. The queen owns all the swans and this tradition may go back to 1100 or before. During the Swan Upping, people go up and down the Thames counting the swans. You are not allowed to hunt or kill swans, possibly going back to a belief that they were tasty and thus reserved for royalty only… Either way, the idea of the swan as a regal bird persists. A bit further afield, in Ireland, there is a legend which tells of a stepmother turning her children into swans for 900 years. Another story, The Wooing of Etain, describes how a king of the underworld transformed himself and his partner into swans to escape the king of Ireland and his armies. In Northern Europe, we see the swan associated with Freyr and tales of swan maidens were well known. The swan apparently gained it’s white colour because two of them drank from a sacred well which held water so pure and holy that it turned everything that touched it white. In Finland, we see a swan living in the realm of the dead and a belief that anyone who killed a swan would die. The swan is credited swan with spinning the thread of thought in one of Hans Christian Anderson’s fairy tales, The Swan’s Nest. Possibly better well known though is the ugly duckling, a story which reminds us of our own true beauty which lies within and which can be hard to find in such a society as ours. Moving now to ancient Greece, we find the story of Leda and the swan which led to the birth of Helen of Troy. The swan is one of the sacred birds of Apollo, was a symbol of Aphrodite her Roman equivalent Venus, both goddesses of love. Heading finally to the east, the Japanese have a story of a swan angel. The swan is a vehicle of Brahma, the Hindu god of creation which we will talk about in relation to the tarot deck below. There is also a belief that swans embody intellect, purity, good judgement, skill, grace, knowledge and creativity. They epitomise the idea of non attachment – being in the world without getting attached to it – as the swans feather does not get wet even when in water. It was believed that mute swans (a type not a description) only sang when they were dying and their song would be beautiful. This is where we get the phrase swan song. Swans are used in the tarot deck to represent the court cards of the cup suit and the fool may or may not be a baby swan. The cups, as well as representing emotion and relationship and love, are used as a sign of creativity. Indeed I don’t know many people who would say that creativity and feelings are not intimately connected. To me, the swan feels a bit like a finished piece of creative work. It is the painting that conceals the tears that went into it, the poetic masterpiece that hides the torment of the poet. The swan appears graceful, tranquil and yet I’m sure they have their share of tough stuff. I don’t think we should hide our emotions. I think we get into a lot of trouble when we do. I do hide my emotions, of course I do, but I don’t think we should strive for that. Instead the message here for me is to recognise that others hide their emotions and difficult experiences as well and you can’t judge someone based on what you see. Like with the ugly duckling story. 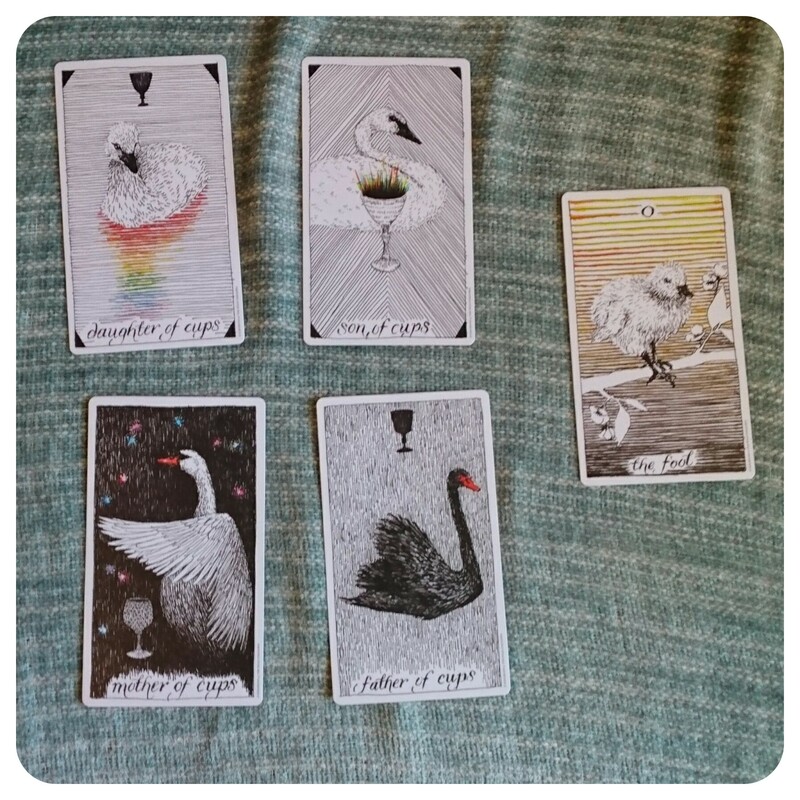 Taking this idea and using it to look at the tarot cards, we see swans in different stages of life. The fool, if it is a swan, is very much a baby. A vulnerable new born setting out into the world, the fool has yet to even start to think about their creative masterpiece. Next we have the daughter who is a little older, she’s finding beauty and rainbows in the world and the water she plays in is calm. The son is a bit older again, wiser, he is starting to pull together the beauty and the rainbows and gather them together to use in his creative masterpiece. He’s starting to feel more intensely and starting to figure out his own place in the world. Mother is a full grown swan. Gentle and aggressive. She protects her creative and loving energy with her wing but she does not constrict it. This is the stage in our creative masterpiece where the work itself is doing something magical. We’ve gathered inspiration as the daughter, collected our tools as the son and now something wonderful is happening to turn it into our masterpiece. The father is content, he has created his work, he is showing the world his calm, reflective, effortless pose. The intense emotional and creative process has climaxed. And looking just at the outcome, the father, the painting, the poem, you wouldn’t know the depth that went into it. I think it’s interesting that the father card is of a black swan when the rest are white swans. When I look at the black swan later, this may help shed some light on this tarot card. As always, for more information about the Wild Unknown Tarot cards, check out Carrie Mallon.